Last weekend, I tried to show my American Couchsurfer some good time – which obviously means I took him out to eat London style: in markets and pop-ups. Here’s some Hawker House and Boss Hoss goodness for you. Saturday morning meant making our way through the crowds of Broadway Market, where I made the most interesting foodie discovery of the week: Boss Hoss Street Food‘s yummy Johnny Cakes. Johnny Cakes are brothers Dave and Gray’s take on North African food, the result of months of travelling and tasting recipes from all around the world. Boss Hoss Street Food’s Johnny Cakes are made out of maize flour. They’re low-fat, wheat and gluten free and they’re topped with their own, clever cheese slice made of a blend of cheeses – including one of my favourites, blue cheese – all crammed together into a single slice and smoked right in front of you. I had the Big Boss orange Johnny Cake, filled with beef hash and tomato sauce spiced with orange, nutmeg and cinnamon and topped with cheese. Totally worth it: tasty but not heavy and a different treat compared to the same old market food. You can find them in the school yard area of the market. 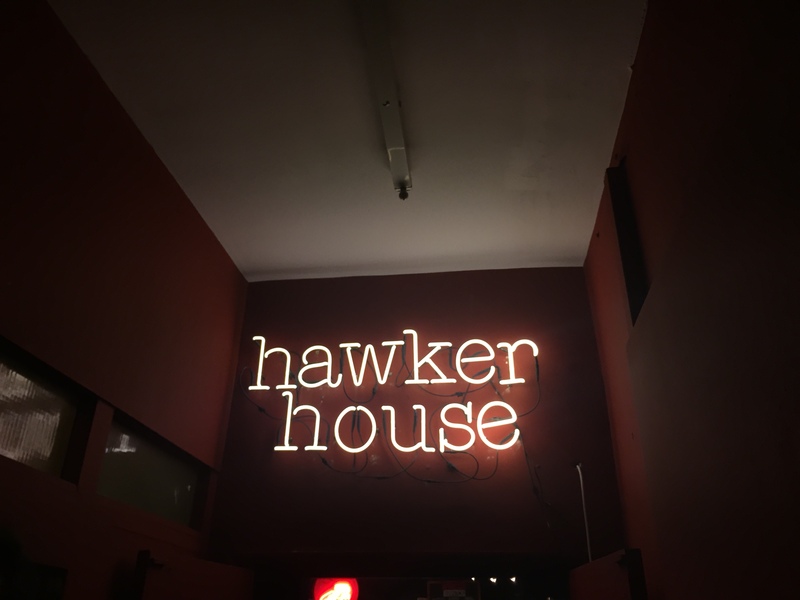 Foodie Fridays and Saturdays in rainy London have just received a boost after Street Feast gave us Hawker House, an in-door version of their summer hangout in the Kingsland Road building that once hosted Fairground. Free before 7 PM, Hawker House hosts three levels of cocktail bars and street food in the likes of Yum Bun, Bob’s Lobster and more. Despite the amazing choice of food and drink, beware: getting in after 8 will make it impossible for you to find a seat and to eat before an hour’s worth of queueing!